Nerd Alert! | Keep It Up, David! A few months ago, I signed up for my third 10k race, and started focusing on my training for it. I hadn’t done much running lately, so I made the decision to keep the pressure to a minimum. As I explained in this post, my return to running didn’t start off great, but I got back into a groove. One of the things I did to alleviate pressure was not update my running chart. I didn’t want to focus on miles, pace and speed, I just wanted to hit the streets and find a rhythm and feel good. But, at the same time, the nerd alarm was at full blast in my brain: what can I do to somehow acknowledge all this running? And then, after the first two runs, I had my light bulb moment: I’ll create a map! I was doing all my running after work, in the neighborhoods around my office, so I printed out maps of that area, and after every run, I marked my route. Such a simple idea, but a really effective one, because it continually pushed me to switch things up and run new routes, so I would have new streets to mark. But, at the time I started this map, I still hadn’t shared on this blog where I was working, because, for the sake of my own sanity, I wanted to separate work life from blog life. I’m also mindful of not sharing certain specifics for general safety and privacy reasons. But my recent appearance on national television blew the lid off of all this, and now that the information about where I’m employed is out there, I have no issue sharing my map. The orange square in the center is the entire block that my office is on, and, as you can see, I’ve fanned out in every direction over the course of the past couple months. I’ve run past Los Angeles landmarks, like Paramount Studios, the Capitol Records building, and along the Hollywood Walk of Fame, and up and down more residential streets than I can care to name. 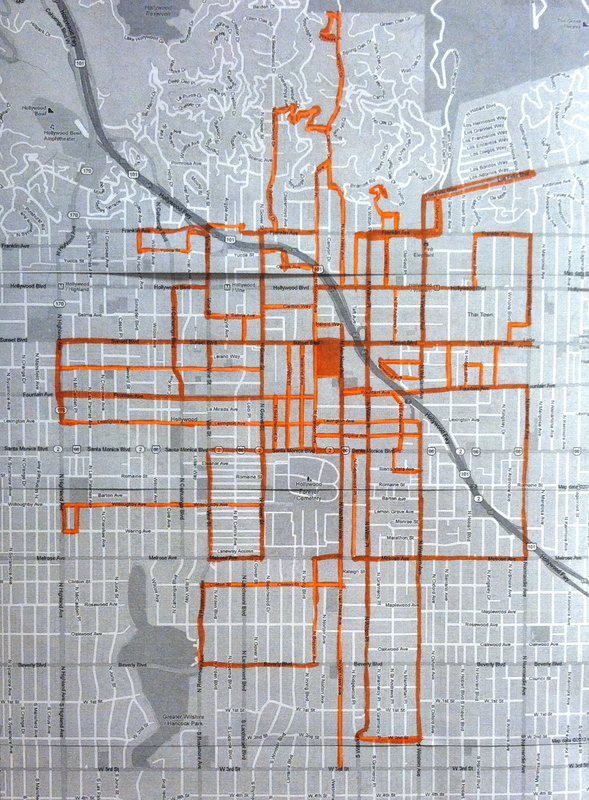 I’ve tried my hand a few times at running up the Hollywood Hills (the squiggly orange lines at the top – they’re steep! ), and crossed over and under the Hollywood freeway more times than I can count. It’s getting harder to add to the map, because I have to run farther to get to streets I haven’t been on before, and I have to remember what those streets are when I’m out on the sidewalks! I love this map. It’s one of the reasons I’ve kept running, even though that 10k I was training for is long over (read my recap here!). And I suspect I’ll continue updating my map in the weeks to come! In other workout-related news, I had two great workout this weekend. On Saturday, I took Richard Simmons’ class at Slimmons. On Sunday, I went to the gym, where I did 33 minutes on a bike, and 16 minutes on the StairMaster. I climbed 66 stories during those 16 minutes, which means it’s time to do something I haven’t done in a while… add a skyscraper to my collection! 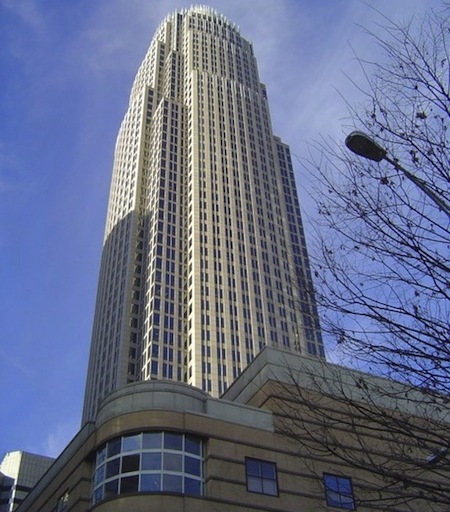 It opened in 1992 as the NCNB (North Carolina National Bank) Corporate Center, but it’s now the Bank of America Corporate Center thanks to a few bank mergers. 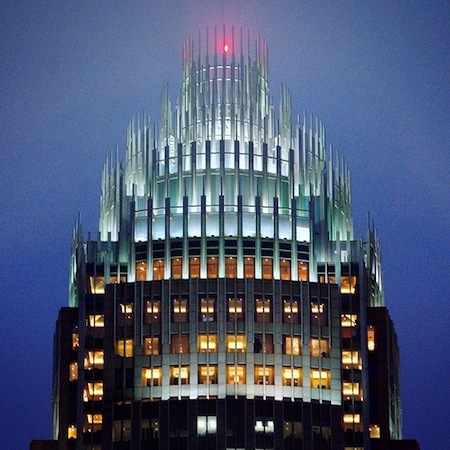 It serves as the world headquarters for Bank of America. It is (or was) known locally as the Taj McCool, after Hugh McCool, the bank executive that spearheaded its construction (again, I’ll have to trust the internet on that one). Time to go add it to my Skyscraper Collection! This entry was posted on Monday, December 17th, 2012 at 12:46 am and is filed under Uncategorized. You can follow any responses to this entry through the RSS 2.0 feed. You can leave a response, or trackback from your own site. 3 Responses to Nerd Alert! Totally cool David. Happy Holidays! Try the Run Keeper app that might help with seeing the streets you’ve run without having to remember them.